Madonna bares her breasts and (ostensibly) her soul in this adulatory, superficial documentary of her 1990 Blond Ambition tour. The young director Alek Kesishian tries to capture Madonna when she’s off guard and just being herself, but you register pretty quickly that she’s never off guard and there is no “self” to her — at least none that she lets us see. The movie shows you exactly the image Madonna wants to put across, and no more; she was the executive producer, and financed the film out of her own pocket. The backstage footage, shot in grainy 16mm b&w (like much of U2: Rattle and Hum), is straightforward, with none of the pretentious jump-cuts or off-kilter framing you get on network news magazines. But Keshishian, whose background is in rock videos, shoots the color concert footage for breathless flash; it’s undistinguished MTV blur. The movie takes on the Sisyphean task of selling this narcissist and media manipulator as an important artist working from some sexual/political agenda. (Throw religion in, too — her concerts are like Las Vegas high masses.) You come away with some admiration of Madonna’s drive and stamina (her shows seem exceedingly gruelling to do) but no sense of who she is and, if you’re not already a fan, no insight into her popularity. Me, I agree with Mr. Blue in Reservoir Dogs — I like her early stuff, but after “Papa Don’t Preach” I kinda tuned out. Guest appearances include Warren Beatty (Madonna’s toy at the time), Sandra Bernhard, Antonio Banderas, and most infamously, Kevin Costner, who makes the mistake of telling Madonna her show was “neat.” Kesishian’s next feature was With Honors, after which he presumably went back to rock videos. Madonna continues to be in movies, unfortunately. In the blink of an eye, blood-red flames sneak under doors, hiss back inside, and roar back out — like the exhalation of a wrathful dragon — to annihilate anyone in their path. Great stuff! If only the rest of the movie were as exciting. The flames, in fact, have more personality than any of the actors; and in a movie that includes Robert De Niro, Rebecca DeMornay, Jennifer Jason Leigh, and Scott Glenn — all of whom perform at peak dullness — that’s extremely bizarre. Kurt Russell and William Baldwin, the main firefighter heroes, are brothers whose fireman father (also Russell) died in the line of duty. There’s much competitive rancor between the bros, much consumption of Bud Lite. Meanwhile, an arsonist goes around torching those responsible for cuts in Chicago’s fire departments. Director Ron Howard functions here as a traffic monitor; he puts us directly inside the fires, but he can’t do much with Gregory Widen’s awesomely tired script. The closest thing to a performance comes from Donald Sutherland as an incarcerated firebug named Ronald. Speaking bashfully of his pyro obsession, Sutherland is eerie enough to make us forget momentarily that this subplot (Baldwin visits Ronald to gain some insights into the arsonist; Ronald demands quid pro quo by asking how Baldwin dealt with Dad’s death) is a tacky steal from Silence of the Lambs, though Widen swore it wasn’t. (Yes, Silence the movie only came out a few months before Backdraft, but Thomas Harris’ novel was published in 1988. 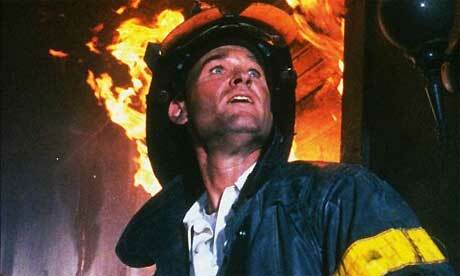 Widen said Backdraft had been in development since 1987, if you want to take his word for it. Entertainment Weekly noticed the similarities, too.) Also with J.T. Walsh, the usual Clint Howard appearance, and lots of actual firemen.